And because this venerable day is dedicated to all the Saints that have been born since the beginning of the world, we must not think it unknown to the ancient fathers, who shone forth with many signs and wonders, curing men of their infirmities, delivering them from every evil, and raising their bodies from the dead. They closed heaven, holding back the rains, and in mercy opened it again. They wept for the sins of the people, setting themselves against the avenging thereof, placating and appeasing the Lord’s wrath. Taught by the Lord, they foretold the Birth of Christ from the Virgin, His Passion and Resurrection, His Ascension unto Heaven, the coming of the Holy Spirit, and the judgment that shall come to pass at the end of the world. And most assuredly do we believe them to also partake in this venerable festivity, and have a share therein. 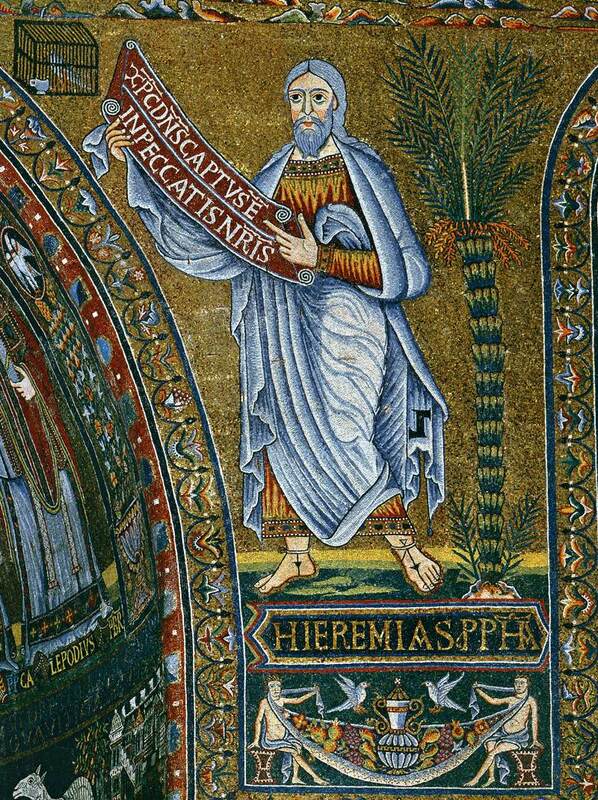 The Prophet Jeremiah, represented in the apsidal mosaic of the church of Santa Maria in Trastevere in Rome, 1140-43. 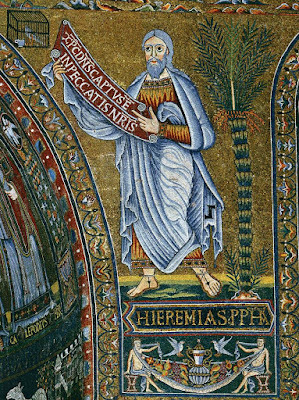 On the banderole in his hands are written the words of Lamentations 4, 20, “Christus Dominus captus est in peccatis nostris. - Christ the Lord was taken in our sins.” The caged bird next to the top of the banderole symbolizes the Incarnation, in which the infinity of the divine nature is in a certain sense confined within the limitations of human nature.